Looking for a deal on a homebrew pump? These are our most recently featured pump (and related) deals. This list may be blank if we’re not currently tracking anything. Note: Availability, price and shipping costs can change quickly. Check each product or sale page to get up to the minute information. Generally speaking these are 110 volt wired versions of these pumps. For some manufacturers, additional versions and part numbers are available in different voltages, capabilities and unwired. I’m guessing most want wired 110 volt pumps. 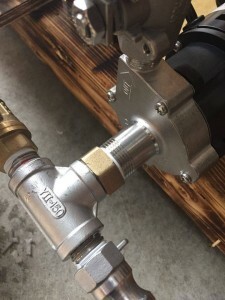 MARK II WORT PUMP – Hands on Review – via ProFlow Dynamics This is one of the better deals for full featured homebrew pump that I’m aware of. March, Polysulfone Head, High Temperature, High Flow Brewing Pump H315HF– via MoreBeer. This is the high flow version of March’s homebrew pump. High temperature(100’C) 6.8L/Min (108GPH) mini DC12V Water Pump. Food grade. Sous Vide – via Amazon. This is a small, food safe pump that may be helpful for moving wort around your system. It needs to be wired. The center inlet chugger has a 3/4″ thread. If you, like many homebrewers, use 1/2″ threads on most of your equipment, you will need to reduce this. Here are a few fitting options. If you use Cam Lock QDs on your setup, Brew Hardware has a custom type A designed specifically for this purpose. Tip: Using a Pedal Foot Switch for Easy Pump Operation – I use this on/off foot pedal foot switch for easy, hands free control of my pump while brewing. One foot press turns the pump on or off. Always be cautious when using your pump with hot liquids and read and follow manufacturers directions. Hot liquids are dangerous. Always be cautious when using your pump with hot liquids and read and follow manufacturers directions. Ensure that your equipment is rated for your desired application. If you have any questions, contact the manufacturer of your equipment.